The idea of replacing your air conditioner probably sounds like a hassle, but the only thing worse is not replacing it when you’re already dealing with a less than satisfactory AC experience. 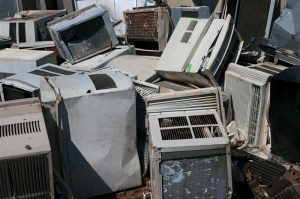 The longer you keep paying for a bad air conditioner, the more money you’ll have spent overall. To help you see it our way, we’ve prepared three reasons why you might need to replace your AC right now. It’s bad enough that you had to get some repair work done not too long ago, but now another part of the machine broke down, too? If it feels like one part after another keeps breaking down in your AC, it’s a definite sign that it might be time for a replacement. Not only that, but the combined costs of each repair are going to rival the cost of a replacement, so you might as well get it over with now. If you’re experiencing this problem and the machine is still under 10 years old, however, you may want to consider trying another HVAC contractor. We’re not pointing any fingers, but it’s definitely not normal for an HVAC system to need several repairs before reaching the average life expectancy. The Seasonal Energy Efficiency Ratio (SEER) rating is your key to understand how efficient your air conditioner is. Similar to a car’s miles per gallon rating, it’s only based on optimal conditions. That means that even an AC with a 26 SEER rating can still fall to a lower number if it’s not used or maintained properly. As of 2015, it became required that any new air conditioner meet or exceed a minimum SEER rating of 14. Between 1992 and 2006, the minimum SEER rating was only 10. That means that if you’ve had an air conditioner since before 2006, your air conditioner is probably spending more in monthly energy costs than a newer model. Even if your AC isn’t malfunctioning or breaking down part by part, increasing your SEER rating will show immediate and substantial improvements to your monthly energy bill. Sometimes there’s no logical, objective explanation for it. If your AC simply isn’t working the same way that it used to, it could be because your AC needs replacement. This is most likely due to the general wear-and-tear contributed to old age. Before you jump the gun on that, though, you’ll still want to call in an HVAC contractor in Whittier, CA for their opinion. There are a range of problems that can cause low cooling power, from simply needing to replace the air filter to a complete compressor replacement. Whether or not the repairs are going to be worth the trouble will be up to you, but at the very least, you should confirm with a professional that your cooling issues can’t be fixed. Need help with a replacement? We’re here for you. Contact Greenleaf Heating & Cooling today!